Markets can overshoot the technical’s for a while. 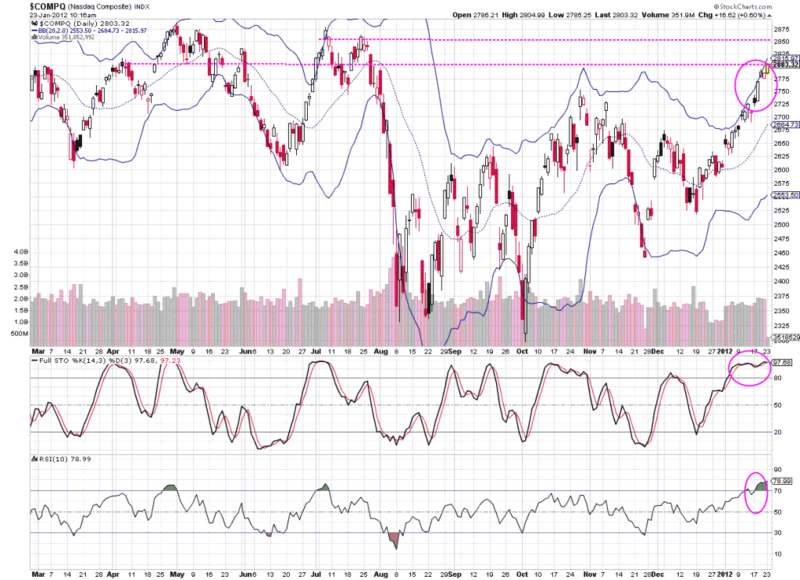 Last week I observed that a few of the technical indicators such as stochastics, RSI and Bollinger bands suggested the NAZ were getting a little overbought. The less significant resistance level (dashed line on the chart below) was easily overcome last week. This pushed the momentum indicators a little higher, which in turn raises my risk antenna a little higher. The next resistance levels for the NAZ are more significant—anywhere between 2800 – 2870 will poise much more challenge for this index. Further, we are now past the peak seasonal strength period for technology – a vital component of the NAZ. Note the relatively low volume on the recent rally for the NAZ. The info-tech sector (illustrated by the SPDR ETF) has long termed resistance at $26.60—it did break through that last week, but follow-through must confirm that breakout. Finally, Sentimentrader.com has gracefully allowed me to print a couple of charts from their daily update. 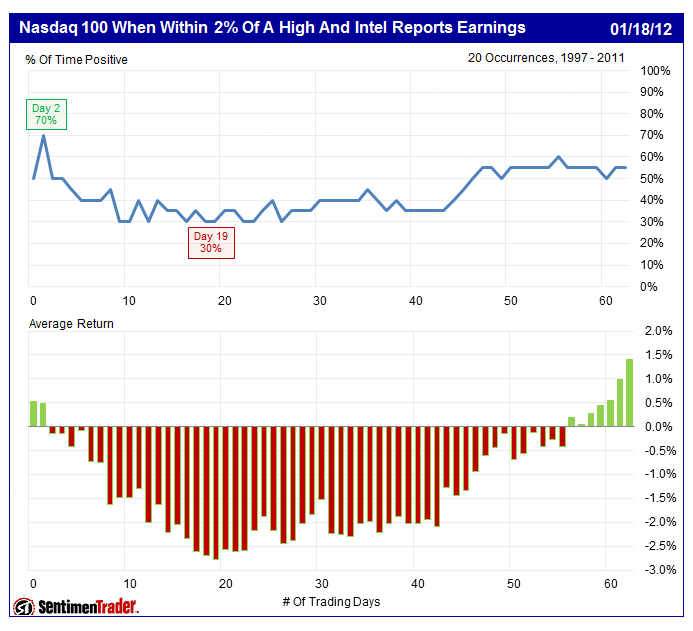 Jason Goepfert notes that high NAZ levels corresponding with Intel earnings reports often lead to a correction of the NAZ. Very interesting stuff. I’ve reduced my exposure to info tech and a few other market movers of late. 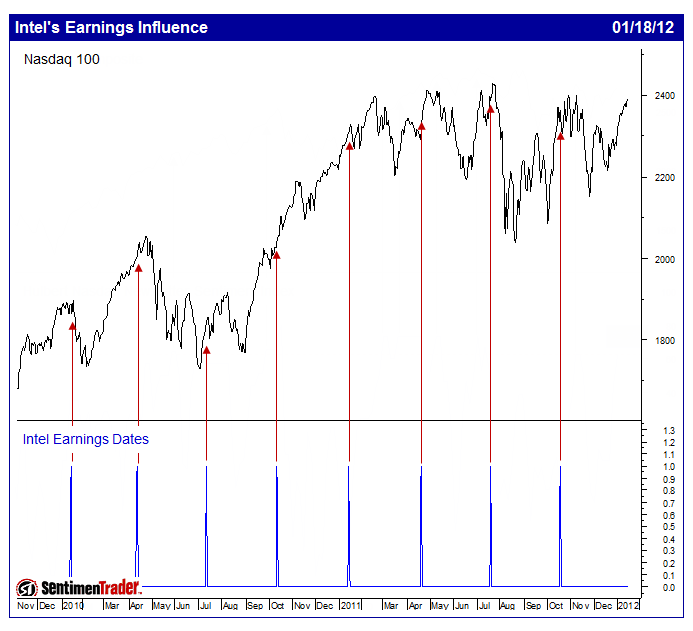 I may be early, but in my mind, the risk for a pullback is beginning to increase.